Since its first version BackupChain has always included the ability to receive backup files over the internet via its built-in FTPS server. It’s by far the easiest FTPS server and very simple to use. 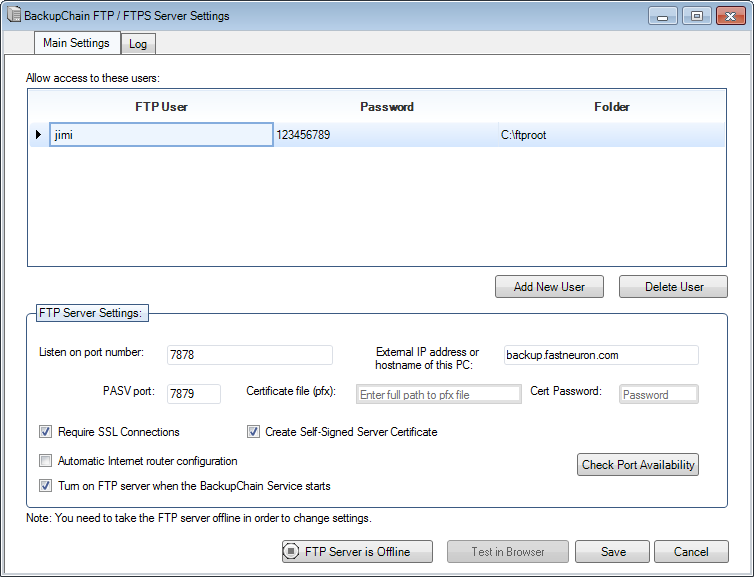 BackupChain includes this FTP server to allow IT Pros to build their own remote backup system with ease and without the need for additional software. Supports FTP as well as secure FTP (FTP over TLS/SSL) simultaneously. All links are encrypted when using FTPS. It’s the only FTPS server that requires only two ports to be opened. You can add as many users as you need, each to their own isolated folder. Select whether FTPS is to be enabled and either provide a security certificate or have BackupChain create one for you. Once the FTP server goes online you can use the ‘test in browser’ button to ensure everything is set up correctly. This FTP server requires only two ports to be forwarded to your server from your router. In the above example, all we would need to do is change the internet router configuration and add two port forwarding rules, one for port 7878 and one for 7879. That’s all the configuration that is required. Firewall exceptions are added automatically if you are using the standard Windows firewall. Our free tool DriveMaker maps a drive letter in Windows to your FTPS site, which naturally you can and should host with BackupChain’s own FTP server. You can use DriveMaker in combination with the BackupChain FTPS server to access data from your home office computer while on the road or at another office. You can also share documents and files easily with other people online who can access the same folders as you with DriveMaker. DriveMaker does all this for you. The mapped drive is accessible from almost all applications in Windows, even antivirus programs. You can simply edit files as if they were local. DriveMaker will upload the file automatically when it’s closed. BackupChain is the only tool on the market to offer deduplication over FTP. Use our FTP backup software to transfer huge virtual machine backups over the internet efficiently, by using incremental deduplication. FTP backups are especially efficient when you have large files backed up with deduplication as the overhead is minimal. BackupChain offers a lot more than just an FTPS server and FTP backup. 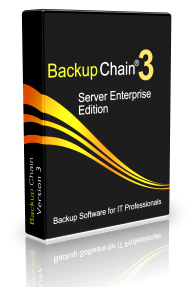 BackupChain is an all-in-one backup solution used worldwide by over 40,000 IT professionals who use it for network backup, NAS backups, version backup, Hyper V backups, VMware backups, cloud backups and much more. Moreover, apart from traditional file backup, BackupChain also includes disk image backup for physical and virtual servers and automatic disk cloning and copying.